Once Medha's tastebuds were back in the right place, and we were caught up on sleep, it was time to make up for bland food. I was craving shrimp, pan-fried in coconut oil. Yes, coconut oil. You might think that I am now part of the coconut oil brigade but, truth be told, my grandmothers cooked with coconut oil. My family, in particular, moved away from all things coconut in the mid-1970s. Western medicine — fueled by the cooking oil lobby, maybe? — denounced coconut oil as evil personified. My mother started using more of tomato-onion sauces as the base for her curries, instead of fresh grated coconut. She also stopped using coconut oil in her cooking because that is what the doctors prescribed. 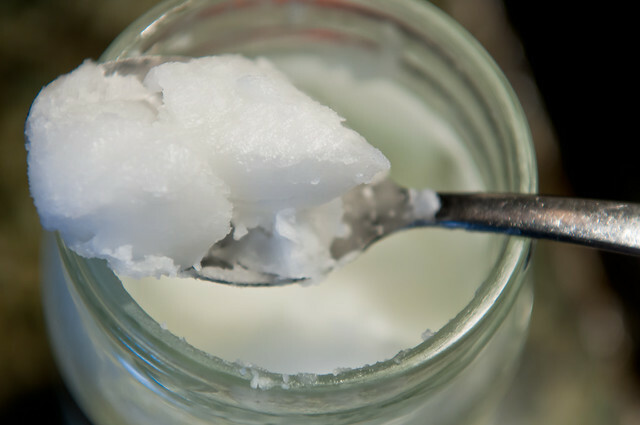 If coconut oil found a use in our home, it was for hot oil treatment for our hair. This meant that I gagged every time I ate anything cooked in coconut oil, from thoughts of oily hair that took over my sensibilities. I had to grow up enough to appreciate that unique flavor and start missing it. 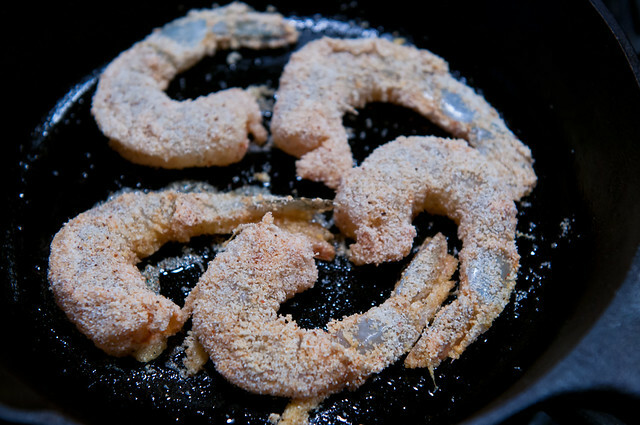 Every time I visit India, I am lucky enough to be served fish or prawns fried in coconut oil by my aunts and cousins. And, every time, I make a mental note to recreate that flavor for my family when I return. But once I am back home, I get sucked into the daily routine (which includes cook, clean and clear up after yourself) that I turn away from frying and seek simple foods instead. The other day I ran out of avocado oil, my neutral cooking oil of choice. How does that even happen?! But I had ghee, mustard oil, extra virgin olive oil, and sesame oil. Medha reminded me that she had bought coconut oil to make vegan cookies for her Secret Santa giftee. So I had that, too. I used it while making dosas and found that unrefined virgin coconut oil found in the stores here does not have that deep coconut flavor that Indian coconut oil has. It was time to bring back some good old-fashioned family recipes into our diet. And that's exactly what I did. I had frozen tail-on shrimp (20-25 to a pound) in my freezer. It's been a while since I purchased frozen shrimp. Lately, I've been seeing "previously frozen" on most of the seafood, even the lovely halibut I bought from Whole Foods for New Year's Eve. I figured it can only go in my favor, especially given that most of my plans don't materialize and I am either cooking to save food from going bad or throwing it into the freezer before it crosses over to spoiled and good only for the compost bin. The simplest marinade for seafood is ginger, garlic, red chile powder, turmeric powder, salt and some fresh lemon juice. I make sure I use at least one of the first two ingredients for flavorful fried seafood. This works for shrimp and it works for fish like catfish or tilapia. Marinate the shrimp for at least 20 minutes, upto 48 hours. Traditionally, seafood is rolled in a mixture of rice flour and fine rava or cream of wheat. I don't bother with the rice flour and use only cream of wheat. This makes frying a little tricky but nothing that anyone can't master easily. I use only as much coconut oil as needed and keep adding more to the pan as it gets soaked up by the shrimp. Use a cast-iron pan for best results. 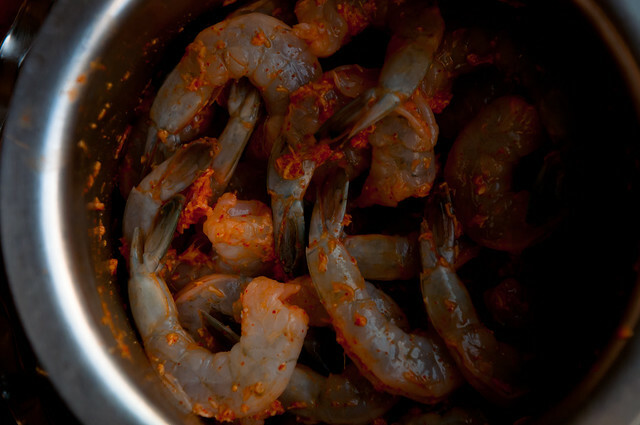 Melt some coconut oil in the pan, carefully add the shrimp and do not overcook. Turn carefully by using flat tongs or a flat turner so that you don't lose the crust to the pan. Add more oil and swirl it around the pan. Cook another couple of minutes and pan-fried juicy shrimp are ready to be eaten. These can be gently reheated in the oven, if made in advance. Mostly we just stand around the stove and eat them as they come off the pan. They make great hors d'oeuvres, too. 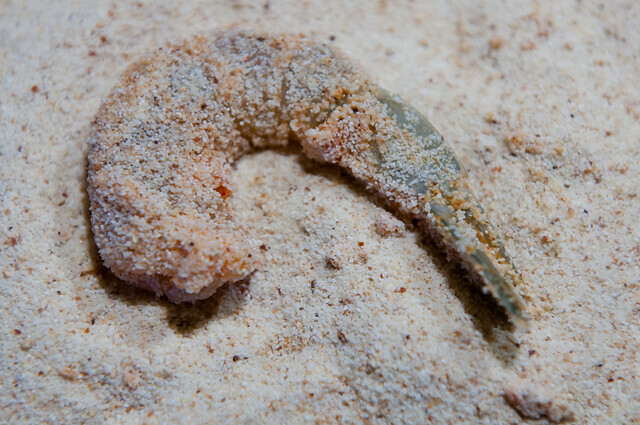 Wash and pat dry shrimp. 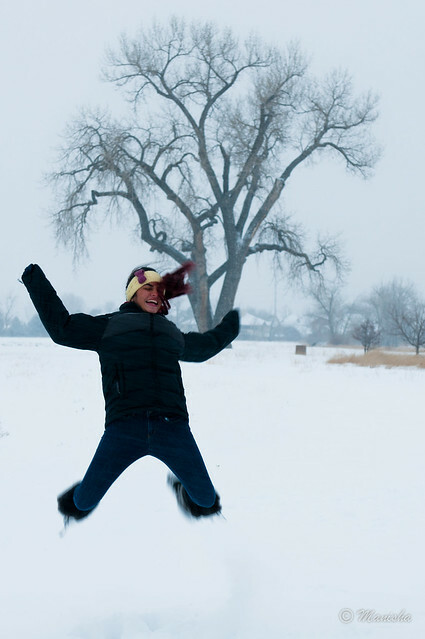 If frozen, thaw shrimp beforehand. Make a mixture of grated ginger, grated garlic, red chile powder, turmeric powder, salt and lemon juice. Place shrimp in a bowl and add this spice mixture and rub gently into shrimp. Marinate for at least 20 minutes or upto 48 hours in the refrigerator. Take 1/2 cup cream of wheat in a plate and dredge the shrimp, about 5-6 at a time, in the cream of wheat, pressing down to coat evenly. Heat your cast-iron pan until hot and turn down the heat to medium. Add about 1/2 teaspoon of coconut oil and let it melt. Swirl the liquid oil around in the pan. Lay the shrimp in the pan carefully. 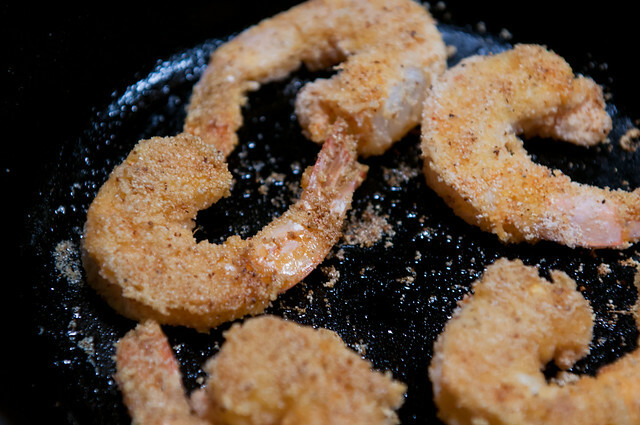 Cook for 2-3 minutes and then carefully flip the shrimp over, using a flat pair of tongs or a flat metal turner, making sure that the crisp coating is not lost to the pan. Once all shrimp are flipped over, add about 1/2 tsp of coconut oil in the middle of the pan and swirl gently so that the oil spreads to the shrimp. Cook for another 2-3 minutes and serve hot. 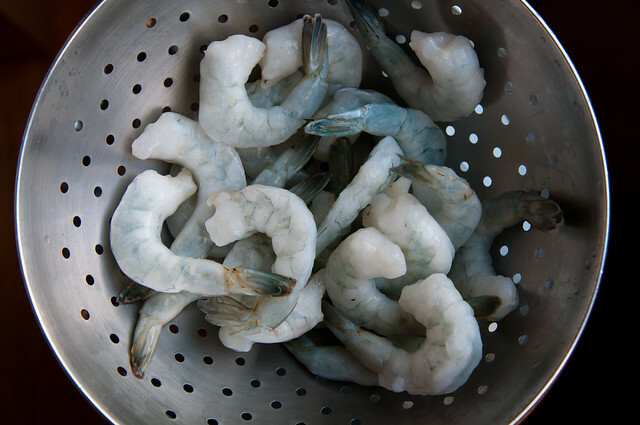 These shrimp can be reheated in the oven to make the coating crispy before serving. 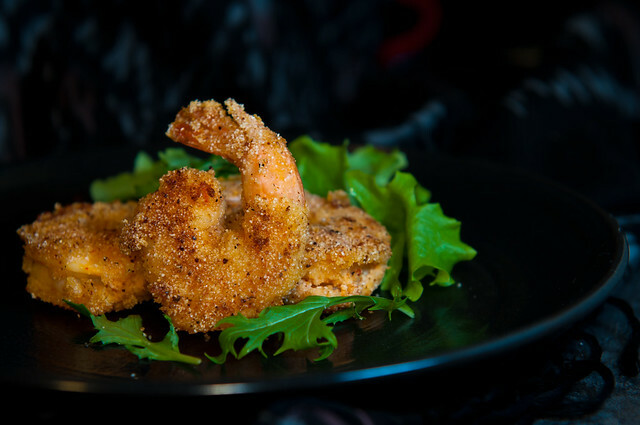 Delicious, crispy pan-fried shrimp with the nutty sweet aroma of coconut oil. I use tender or young ginger in my cooking as that is what is readily available. Recently, I found mature ginger at my Indian grocery store and that has a more intense flavor than young ginger. With tender or young ginger, you may want to use upto 1 tablespoon of grated ginger instead of the 1/2 tablespoon recommended in this recipe. If you don't have coconut oil, you can use any other cooking oil, preferably neutral. But I do recommend that you get hold of coconut oil, if not just to make these pan-fried shrimp! Oh you make me long for home! Coming from the state of Goa but raised in Mumbai. Growing up coconut oil was used to make all goan fried fish recipes more authentic. Have you ever tried dried fish just simply pan fried in a little coconut oil? Heaven! I think I'm in love...and I haven't even tried the recipe yet! I use coconut oil for stir fries etc and it's gorgeous. Good on toast instead of butter, too! Going into my fourth month using coconut oil my memory is much better and I find I am over the agoraphobia which has plagued my life for the past 15 years. Tastes good, too! I have to start stocking coconut oil! I know what you mean about gagging and thinking of oily hair! But then my uncle went and married a Mangalorean and I got hooked on the plantain chips fried in coconut oil! Now, I won't eat banana-chips unless they are fried in coconut oil! But sea food is something I rarely cook since I have grown up far, far away from the sea and it is only now that frozen produce is making its way into our stores. I must learn to give up my hesitation here and get some soon! Nothig could be simpler than this recipe! @Pelicano, what is G-G T-C? Not an abbreviation I'm aware of and I'm curious! Unknown, I know what you mean! We have roots in Goa and still have family there. Coconut oil is a traditional ingredient! And, yes, dried fish pan-fried in coconut oil is just divine! Pelicano, right. I'm sure that you will surely try! Anita, technology frustrating you much?! A lot of recipes from Kerala have coconut oil in the last step: stir some coconut oil into the curry as a final flavor enhancer. Shrimp needs to be deveined and cleaned properly. You can always ask your fishmonger to clean it for you. Maybe 2015 can be the year for new things like seafood and coconut oil! It's so good to have u back! Being a malayalee I cook a lot of food with coconut and coconut oil. It's amazing how different veggies cooked with the same jeera,coconut, combinations tastes SO different!